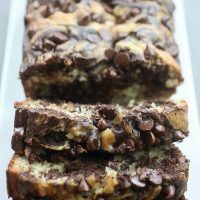 Calling all peanut butter cup lovers! 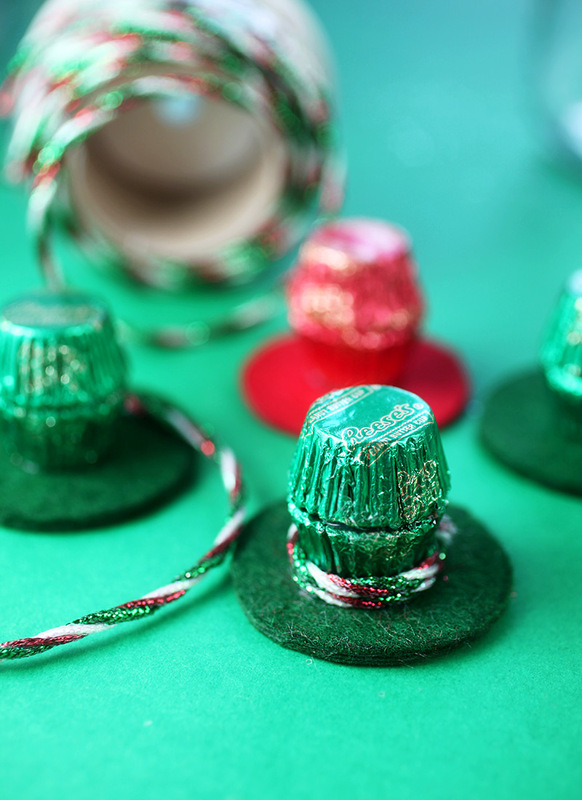 I’m partnering with The Hershey Company this holiday season and getting crafty with candy. 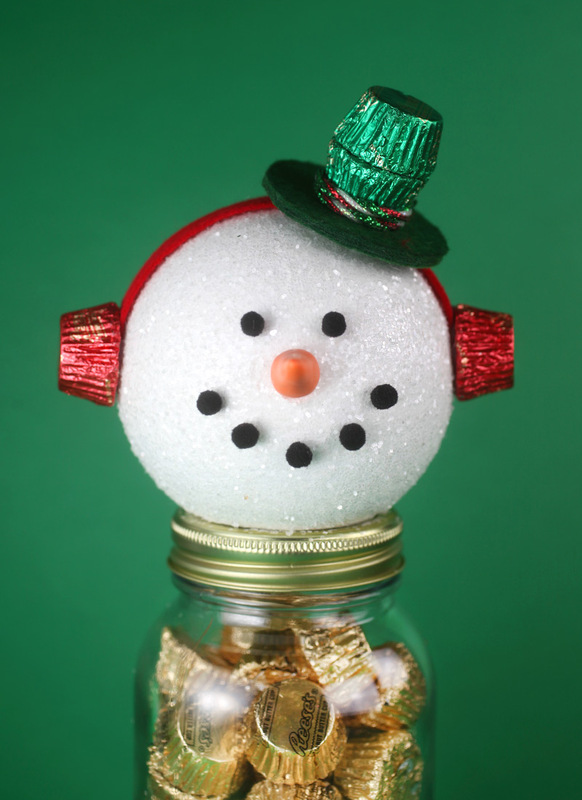 I made the sweetest snowmen candy jars and you can make them too! 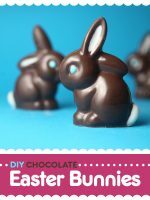 I’ll show you how easy they are with the help of REESE’S Peanut Butter Cups Miniatures. REESE’S Peanut Butter Cups are by far my first and forever-favorite go-to chocolate candy. So, getting to play with them for The Hershey Company makes me super happy. 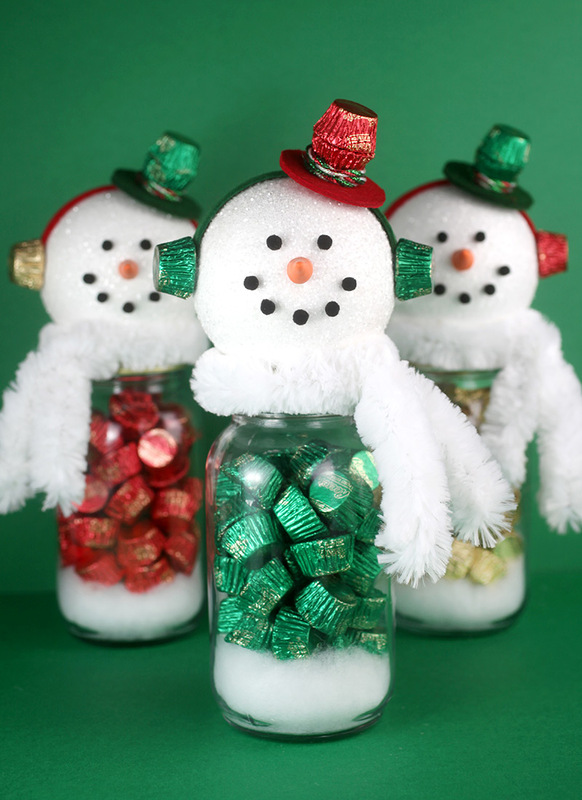 I hope these sweet snowmen make you just as excited to get crafty and celebrate the holiday season! It’s a fun way to make special memories with friends and family during one of the most festive times of the year. Plus, they make pretty adorable handmade gifts. 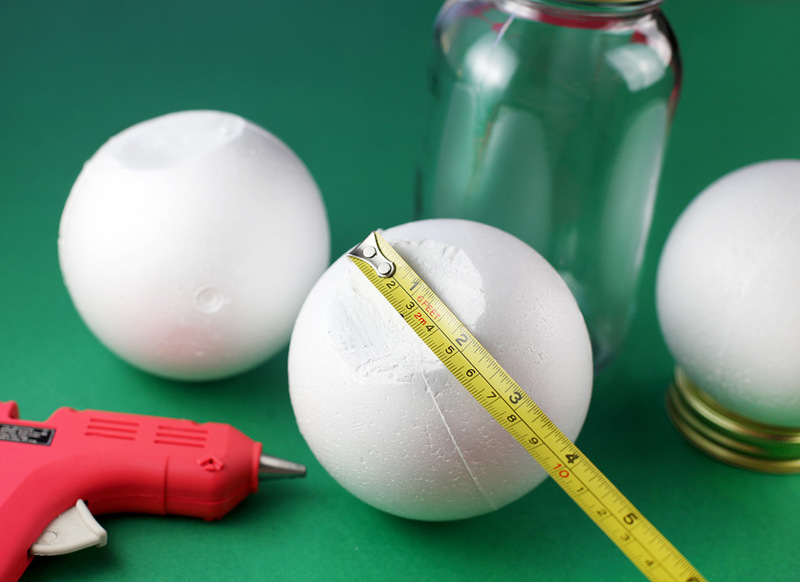 Start out by trimming off the bottom of a four-inch smooth styrofoam ball with a sharp knife so that the diameter is about two inches. Place the ball on top of a towel when cutting so you don’t dent the ball. 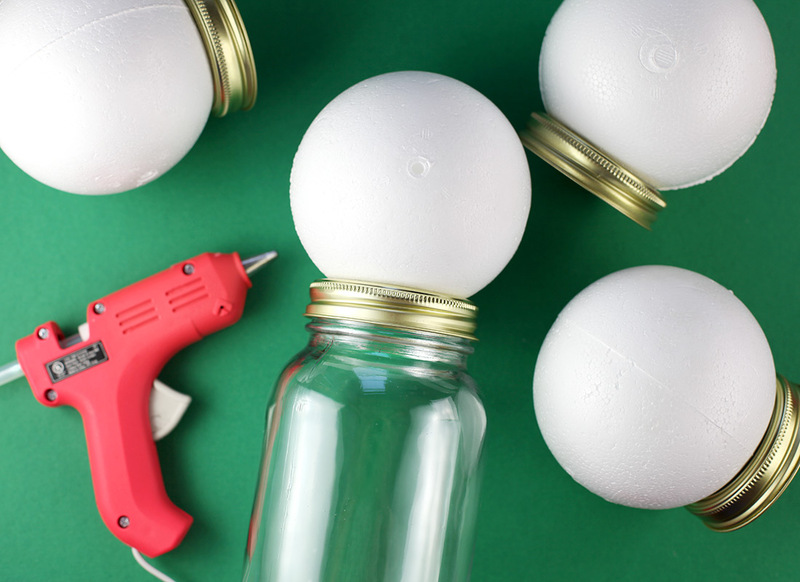 Attach the bottom of the ball to the top of a mason jar lid using a glue gun. Press firmly and hold until secure. The width of the ball will keep the two pieces of the mason jar lid from separating — this way you can still rotate the ball in position where you need it to go after the lid is on. 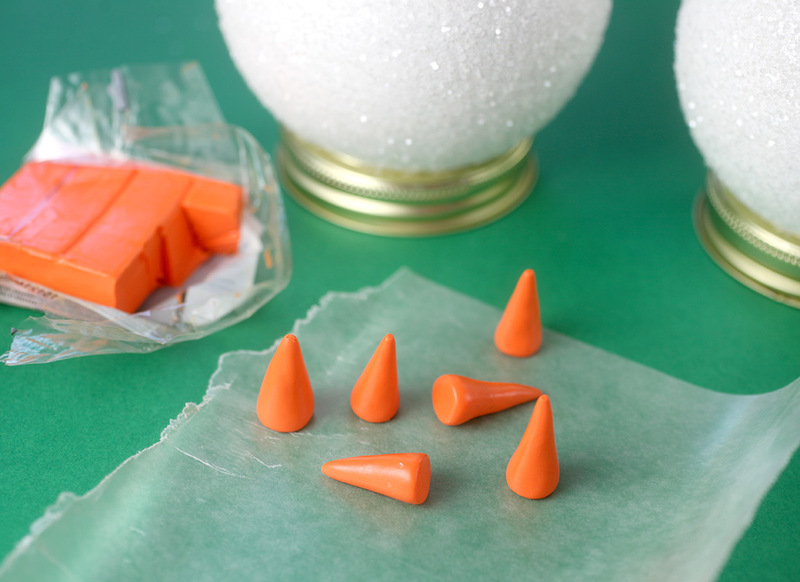 Make cute cone snowman noses. Shape out of orange clay (bake in the oven to dry out using directions on the package). 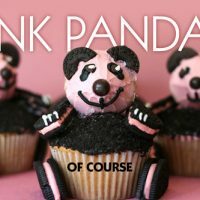 You can also shape out of fondant and let dry. 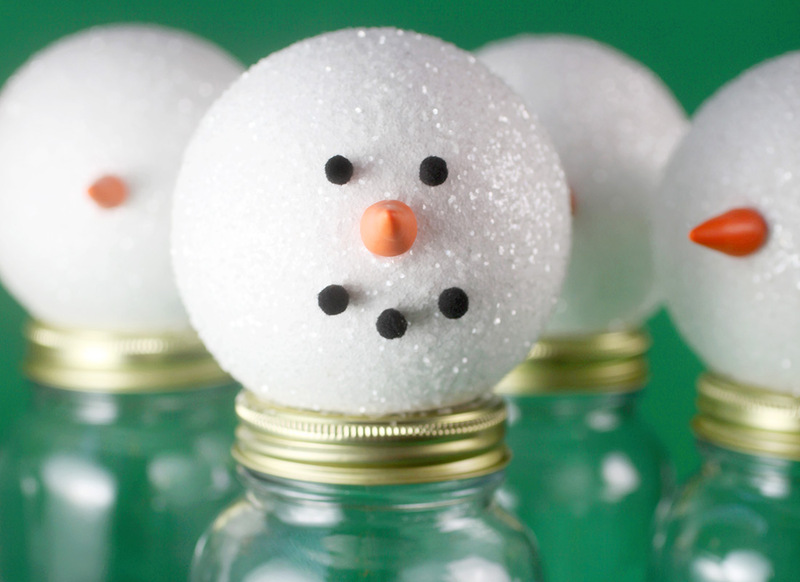 While the noses dry, you can get glittery — The really fun part. 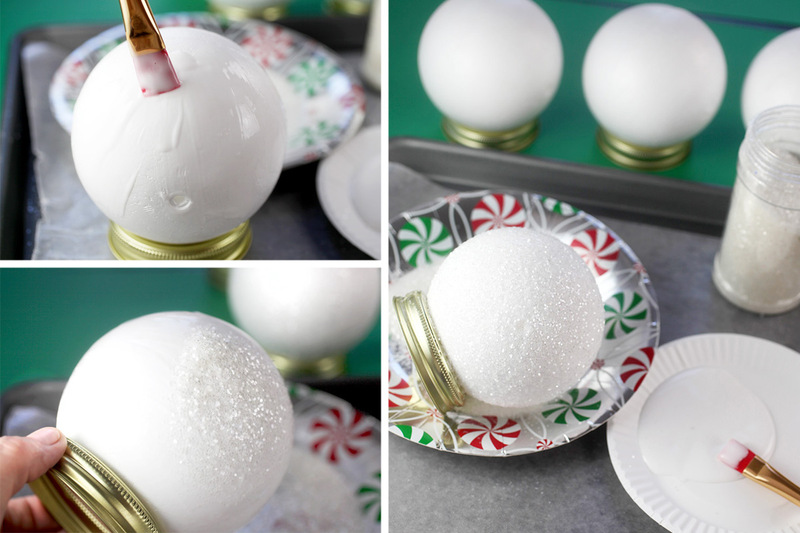 Using a paintbrush and holding by the lid, paint craft glue over the surface of the styrofoam ball and sprinkle with white glitter. Let dry. 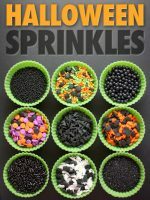 Make sure to sprinkle over a large paper plate so you can easily fold and return any excess glitter back to the container. Here’s a little hat trick. Cut out 2-1/4 inch circles out of adhesive felt. Attach three pieces together to increase the felt thickness and make a stiff brim. 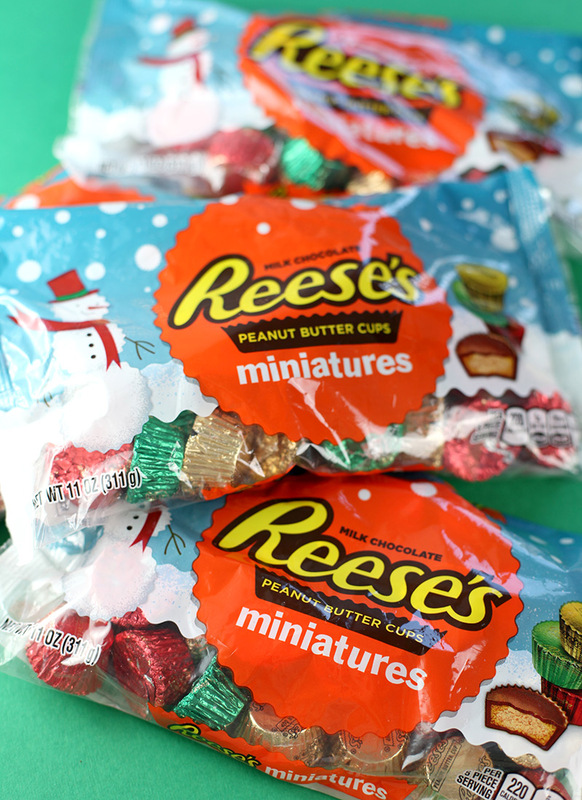 For each hat, attach two REESE’S Miniatures together with the tops facing each other. To attach, break a toothpick in half and push through the bottom of one candy. 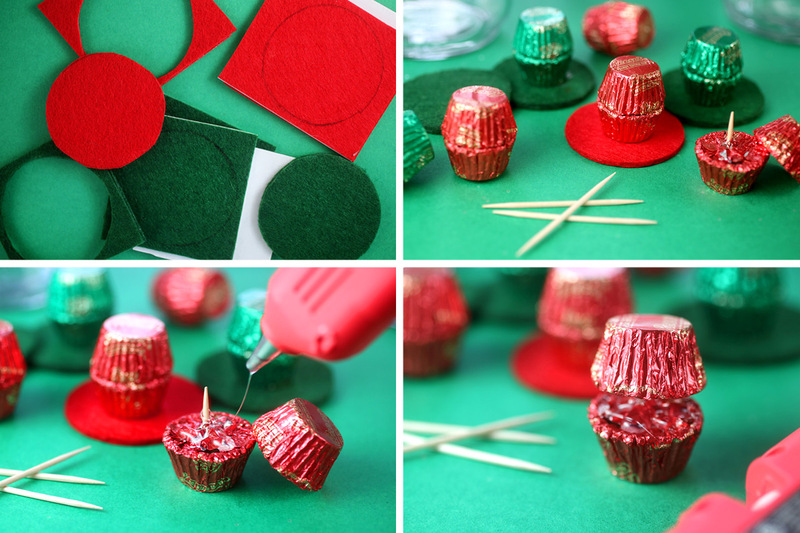 Use the glue gun to attach the second candy top-side down. Press gently until secure and let dry. 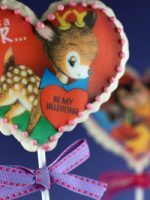 Attach the candies to the felt brim using the glue gun again and then tie ribbon or twine around the base. Use a dot of glue in back to help secure the ribbon in place. Time to put our faces on. Use tiny black pom poms for eyes and mouths. Attach to the front using craft glue. 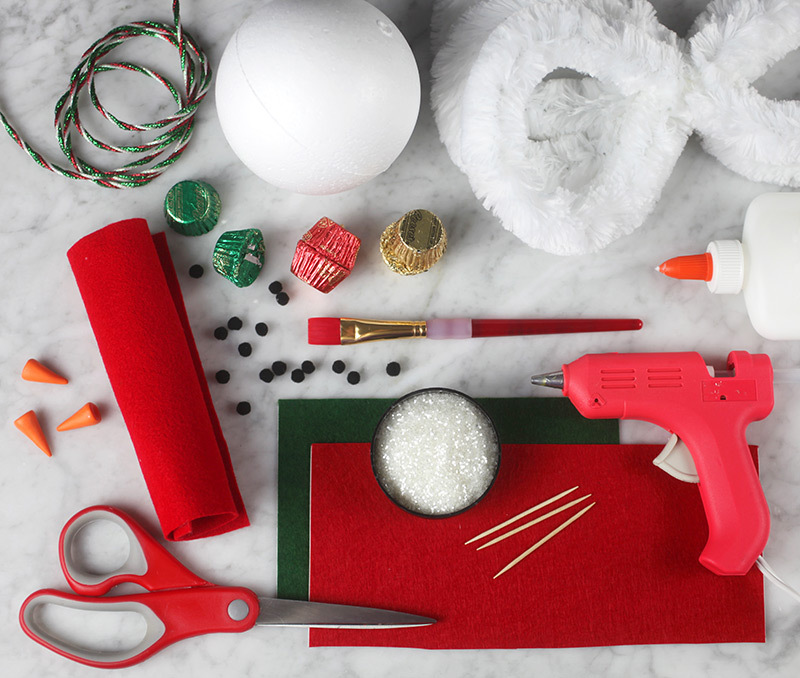 Use the glue gun to attach the nose and let dry. 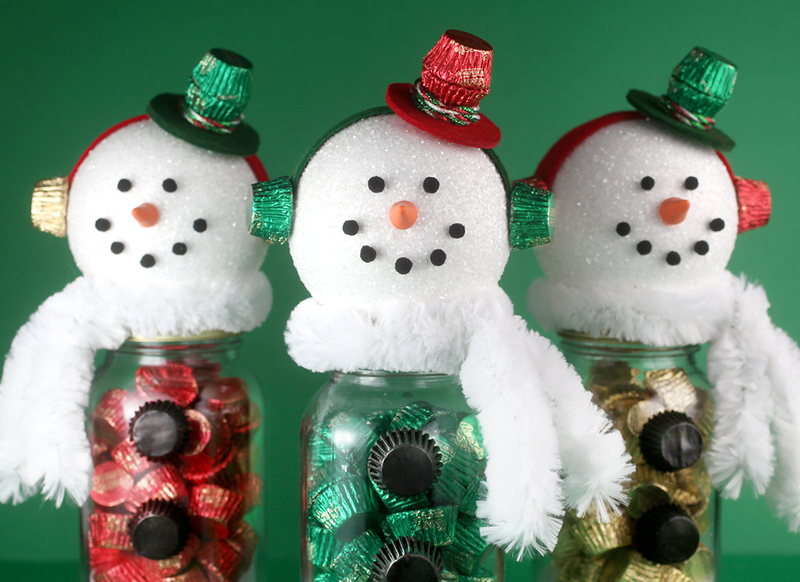 Fill the jars with REESE’S Miniatures. You can do all of one color or mix and match with your favorite foils. I love the solid color look for these. Oh my gosh… snow cute!!!! 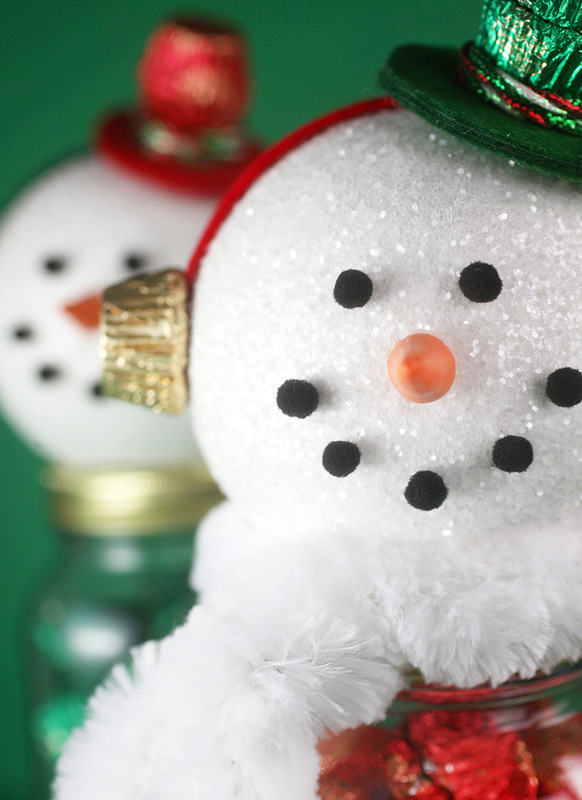 Attach a 1 x 6-inch felt strip to the snowman’s head using a glue gun on either end to secure. Then, glue a REESE’S candy on either side for ear muffs. Finish the face by attaching the hat on top of the headband, slightly tilted forward with the glue gun. He’s looking pretty dapper just like this, but snowmen get cold and they need to bundle up. Twist tie a fluffy jumbo chenille stem around their necks to keep warm… but really just to be cute. Like super cute. I’m in love. 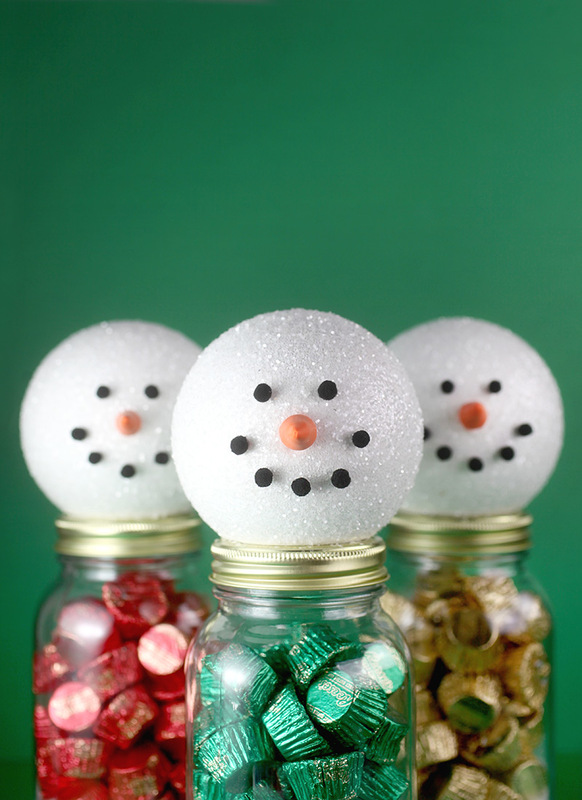 If you like, before filling the jars with candy, place a small handful of fluff in the bottom for snow. But wait, our snowman needs to button up. That’s right, remove foil wrappers and the candies make perfect buttons. 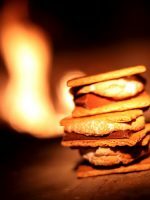 Just melt a little chocolate candy coating and apply to the top of the candy with a toothpick. Press candy gently to the front of the jar and hold in place until set. 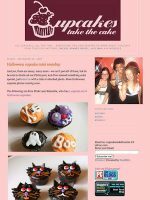 This post in partnership with The Hershey Company. These are just the cutest!!!!! Love these sooooo much. Great as gifts. So cute and so clever! 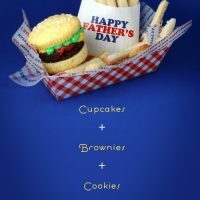 What an honor to work with Hershey’s! Yummy! Thank you and I know. So happy to get to play with my fave pb cups. They are my favorite too! 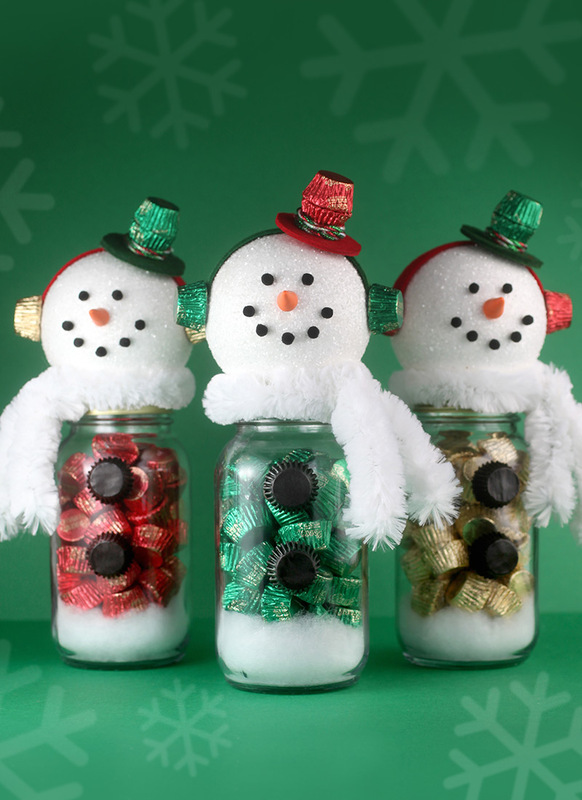 Such cute jars — love them! I can’t wait to try this. Such a cute gift for reeses lovers. Yep. I plan on giving these to a few special people. Just too good! You know what i din’t saw a better snow cute! but this one. 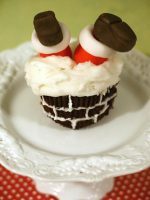 thats so creatve and cute i loved it i want to make that for christas for sure :D :) !! So cute! I’ve been stalking your page waiting for you to post your friend’s candy themed Christmas tree!!! Hey Riva – me too, but I don’t know if she’s going to be decorating as much this year. we may just have to enjoy old pictures.